The March 12, 2009 lunch brought together another fine group of '63ers with 7 classmates attended. Among the regulars attending were Jerry Dwyer, Doron Gopstein, Bob Heller, Don Margolis, Paul Neshamkin, Larry Neuman, and Tom O'Connor. As usual, discussions were about recent events and past exploits. Bob had just returned from a trip to Vietnam and Cambodia, and this led to a discussion about the changes in these countries over the last 40 years. Tom recalled being struck by the changes when he visited in 1994, and Bob confirmed that the move to a market economy was even more obvious now. He mentioned the juxtaposition of a rice farmer pumping water up to his rice paddies using the age-old methods, while over his shoulder, a billboard advertised the latest high-tech products. Doron brought copies of The Spectator from our senior year and shared an article about Tom's rugby exploits with him and one about the Eastern fencing championships with Don. Don related that the fencing team, in fact, successfully gained revenge on NYU and Navy, who had beat them earlier, by completely dominating and winning the championship. 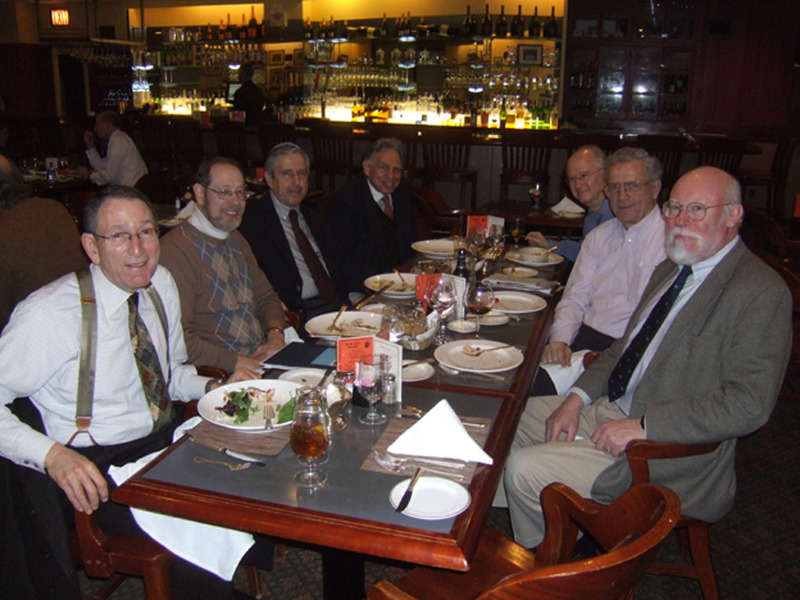 (Seated from left to right) Bob Heller, Don Margolis, Doron Gopstein, Larry Neuman, Jerry Dwyer, Tom O'Connor, and Paul Neshamkin. Click here to see more March lunch candids.